How Christian, or how Pagan, was the Iberian Peninsula in the Middle Ages? And how do we go about answering this question? To do so we need both to define terms and to identify the evidence. By how Christian I mean to what extent did its inhabitants practice Christianity? By how Pagan I mean to what extent did its inhabitants practice pre-Christian cults? The two, as we will see, are not mutually exclusive, and the evidence ranges from plastic arts such as Romanesque buildings, to literary forms such as epic, ballad, and chronicle, to modern popular festivals in which clearly pagan practices and figures persist. 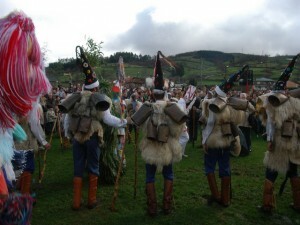 In the North of the Iberian Peninsula, Celtic cults persisted well into the twentieth century as folk practices, and in some cases were Christianized. In the south and the Mediterranean coast, Roman cults were transformed into those of the Saints and the Virgin. All over the peninsula, the Church raised churches and hermitages at traditional cultic sites such as springs, rivers, and cliffs where locals paid tribute to pagan gods. Celebrations of solstices and other events marking the agricultural cycle were likewise covered with a veneer of Christian doctrine, but were essentially pagan in substance and symbology. The scholarly narrative of the Christianization of Iberia tends to assume that once Iberian monarchs became Christian, paganism was relegated to mountain villages and the high pastures. The further you get from the towns, the less Christianized people were. However, this narrative is based largely on Christian sources, which stands to reason: if the institutions producing durable art and letters are Christian, they are not likely to be openly promoting pagan values. If we take Christian literature as the sole measure of the impact and saturation of Christian cultic practice, we are looking at a badly skewed sample. However, even Christian cultural practice belies a lingering paganism in the Peninsula well after we assume the total defeat of organized pagan religion under Christianity: you just have to know where to look. Eleventh-century Romanesque art, much of it in churches, bears ample evidence of pagan traditions. Castilian epic poetry likewise preserves features of pre-Christian mythologies. 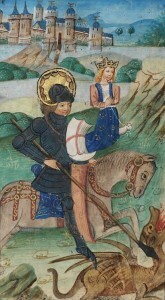 Hagiographies and other representations of Christian Saints preserve characteristics, narrative features, and reminiscences of pre-Christian cultic practices. Popular pagan celebrations and beliefs related to the agricultural cycle are alive and well both in popular festivals and in medieval ballads sung at the festivals. 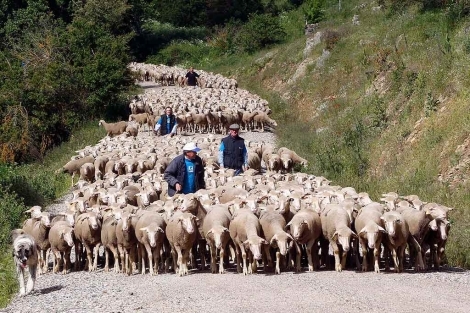 Even the modern oral traditions of parts of Spain preserve folk mythologies that are at best uneasy companions to Christian doctrine. Fairies come out during summer solstice; white stags herald the appearance of fertility goddesses, and the Celtic rain god controls the weather. 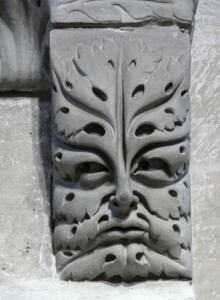 Pagan traditions, symbology, and iconography are represented in the Church art of the twelfth and thirteenth centuries. 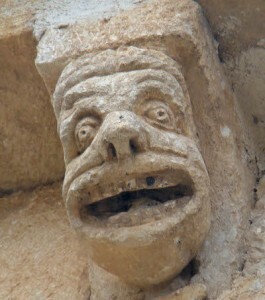 Amidst the secondary ornamentation in a number of Iberian Romanesque churches one can find representations of local mythological traditions, usually dismissed by art historians as fanciful or grotesque figures. Whole series of figures tucked away in corbel tables behind the central nave of churches, hidden under the lids of misericords, or in otherwise marginal positions in ornamental programs of churches and monasteries reveal nods to local mythological traditions that have evaded the gaze of most art historians, but that ethnographers recognize instantly as figures from local mythologies. Many of these traditions, medieval and modern, are syncretistic: Celtic and Roman gods are refashioned as saints. Others are agonistic: saints and priests do battle with the old gods or spirits in a kind of popular mythomachia; the parish priest defeats the local dragon. The burning question is how to interpret this evidence: on the one hand, the transformation of a pagan God into a Christian saint is normally not taken as evidence of a persistent pagan cult. However as most aspects of human culture, religion is not necessarily a zero-sum game. We need to allow for for the possibility of elements of more than one cult to co-exist and for both to be meaningful. Scholars have long studied and celebrated the resilience of African and Indigenous cults to survive in an officially Christian context in the New World. We might likewise re-evaluate the evidence of pre-Christian cultic practices in Christian Europe with an eye toward assessing how popular religious practice and Christian art in medieval Iberia transmitted and transformed pre-Christian traditions. 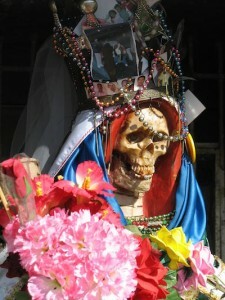 a Santa Muerte south of Nuevo Laredo, Mexico. Religions cross over, assimilate, and blend, and Christianity should not be considered different in this aspect. When Roman religion came to the Celts and the Germanic peoples, their gods assimilated to the Roman Gods. When Christianity overtook the Roman Gods, or their Roman-Celtic amalgams, a similar process obtained; in the loosely translated words of Pierre Saintyves, “these gods were often transformed and Christianized, topped with a golden halo and placed in a Christian heaven, where they might enjoy the glories and triumphs of the new Olympus.” In this process, Christian places of worship ended up with the same images, statues, and legends as the old temples, and the that the masses might confuse the Saints with the old Gods is understandable (Saintyves 11). Richard Fletcher has written on the persistence of paganism in the countryside of Western Latin Christendom. He reminds us that country folk are “notoriously conservative” and that the cultures they developed over centuries “for managing their visible and invisible environments, were not going to yield easily, perhaps were not going to yield at all, to ecclesiastical injunction” (Fletcher 54). How to deal with the stiff-necked peasants? Work with them. Pagan-Christian syncretism was likely equal parts hegemony from above and resistance from below. Pierre Saintyves pointed out as early as 1907 that priests found it more convenient or expedient to allow the people to persist in their popular practices, provided they subordinated these to the Christian cult. I am suggesting that the Church partnered with the rustic pagans in order to maintain hegemony. There is, in my opinion no other way to explain some of the Iberian evidence upon which I am about to touch. None other than Saint Jerome makes the same argument. 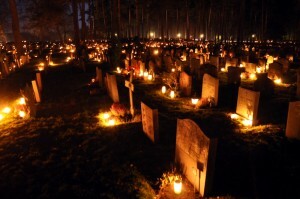 After the Council of Elvira in 300 banned the pagan practices associated with All Souls’ Day such as burning candles in cemeteries to honor the dead, many churchmen worked to enforce the ban and wean the people off of their traditions. Baronius argued that burning candles would upset the souls of the dead. Jerome is more pragmatic. He argued that provided they burned candles to honor the Saints instead of their dead relatives or local gods, there was no reason not to accept the practice (Saintyves 89). Other examples are more convoluted. One explanation for many saints’ miracles, according to Pierre Saintyves, is the literal interpretation of symbolic imagery. For example, there are a number of saints that are said to have picked up their decapitated heads before ascending to heaven. This is a symbol of preparing to meet your Lord, just as a wounded warrior would present himself before his lord after battle for formal review before mustering out. Here a rhetorical figure is interpreted as a physical miracle. Another example, also from Saintyves, is the saint fighting the dragon, meant to be taken as a symbol for evil, but interpreted as a literal, physical beast (Saintyves 124). One wonders if Christian preachers and writers purposefully used these images because they had value in pre-Christian traditions of the proselytes, but then backfired. For example, if in preaching about a saint, one describes him as defeating all evil, here personified as a dragon. The audience might then rely on their own traditions and imagine this saint defeating the local dragon that in turn symbolizes (in a less abstract way) the vicissitudes of nature. This is borne out in modern ethnography in which informants report (as late as the twentieth century) that local priests defeated the dragon that had been harassing the village for centuries. The converse is also sometimes true: Charles Plummer, in his study of Irish Saints’ lives, noted that epithets of Celtic gods that were meant to be taken literally were often interpreted as metaphoric in Christian sources. By this logic, a Celtic sun god who is described as having a face “as brilliant as the sun at midday” becomes a Saint whose beatific face radiates only metaphorically (Plummer cxl). All of this evidence points up a long, slow syncretic process that begins with the arrival of Christianity to the Peninsula, but that is still in play. Pagan cultic practices, now classified as superstition or local tradition, persist, sometimes aided and abetted by Christianity, other times in despite it. Fletcher, Richard. The Barbarian Conversion: From Paganism to Christianity. New York: Henry Holt and Company, 1997. Print. Plummer, Charles. Vitae sanctorum Hiberniae. Oxford: Clarendon Press, 1910. Print. Saintyves, P. Les saints successeurs des dieux. Paris: E. Nourry, 1907. Print. Essais de mythologie chrétienne. This is the text of a position paper I gave at a roundtable titled “How Monotheistic was the Mediterranean?” moderated by Prof. Sergio La Porta (CSU Fresno) and including Profs. Fred Astren, Samuel Cohen (Sonoma State), and Roberta Ervine (Nersess Armenian Seminary), during the Spring 2016 Mediterranean Seminar Workshop at CSU Fresno. Many thanks to Mediterranean Seminar co-directors, Profs. Sharon Kinoshita (UC Santa Cruz) and Brian Catlos (U Colorado) and to conference organizer, Prof. Sergio La Porta. This entry was posted in Pagan Iberia, Spanish Crusader Fiction and tagged Celtic mythology, monotheism, paganism, Roman religion, romanesque, saints' lives by David Wacks. Bookmark the permalink. Would the persistence of sites of religious practice fall under your argument? I’ve always been struck by the fact that Reconquest churches were built on the site of toppled mosques, which in turn had been built over Visigothic churches, themselves on top of Roman temples…. People gonna pray where they wanna pray, no matter what you call the god. Didn’t we think this already, though? How Islamic was medieval Iberia? If you look at population numbers, Muslims far outnumbered Christians in some centuries. I had the same question as David Wright — I’m not a medievalist, but if we know this already for other areas of Europe, I wondered, is this somehow a controversial point for Spain nonetheless? Katrina (and Roger), it’s clear that we know that pagan traditions survive, but in the case of Spain there has been very little academic work synthesizing the evidence from art history, folklore, and literature. There are scattered articles but no monographic study. I’m guessing this has to do with Spain’s relatively recent disestablishment of the Church, which happened MUCH earlier in England, France, Germany.